It’s been a while since I’ve broken down some studies for you, so I took on a big one. I’m sure you’ve heard of coral bleaching. What is it? Why does it happen? Why does it matter? To start off, you need to know a little bit more about the individuals that make up a coral head (fan, whip, etc. ): the polyp. Coral polyps look like tiny plants but are actually tiny animals (less than ½ an inch in diameter). 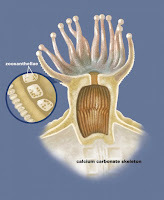 They produce calcium carbonate to create a protective shell or skeleton that, when thousands are living together, make up what you see as a single coral head. 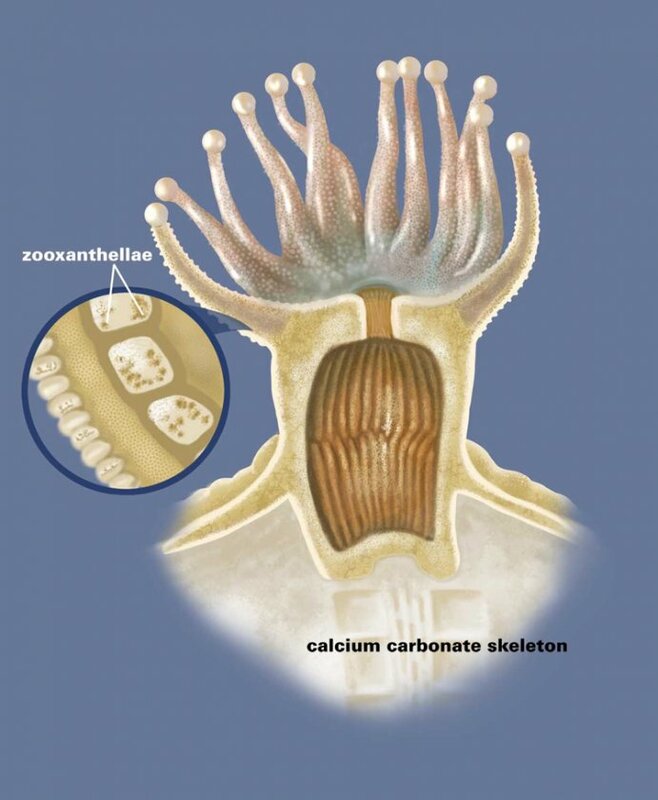 Really, only the outer-most layer of a coral head is actually alive (yes, they build their houses on top of the skeletons of their ancestors). Lots of individual corals make up a reef. Polyps have stinging cells (nematocysts) on their tentacles that capture any prey that swims a little too close. But a polyp does not live alone inside of its skeleton-house; it is actually in a symbiotic relationship with dinoflagellates (a.k.a. marine algae) called zooxanthellae (zo-o-zan-THELL-ee). Zooxanthellae live inside the tissues of the polyp and photosynthesize, passing some of the energy they make to the polyp. They get a place to live and the polyp gets some energy, it’s a win-win. And, it is the zooxanthellae that give the corals much of their color. When the coral gets stressed, it expels the zooxanthellae, causing them to turn completely white. Not dead, but very stressed and more likely to die. 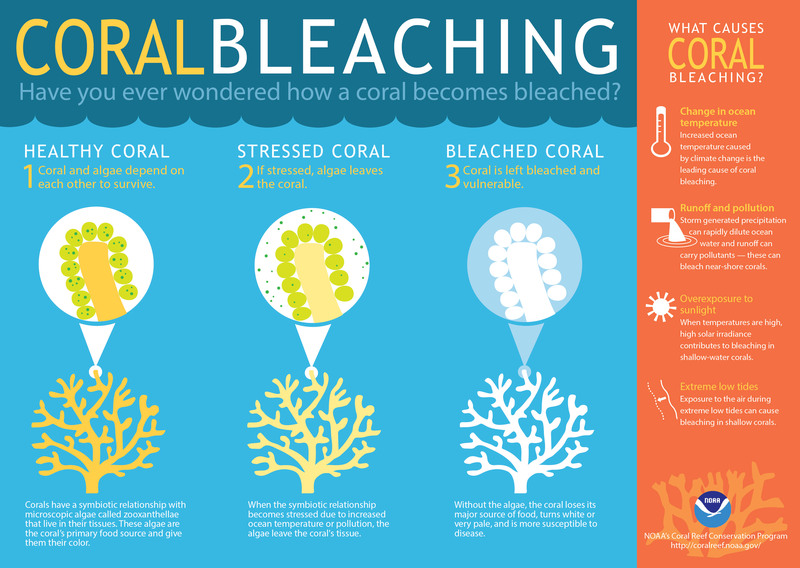 This is coral bleaching. All sorts of things can stress a coral and cause them to eject their zooxanthellae: temperature, light, tides, salinity, or nutrients. A polyp has cemented itself in its skeleton-house so it isn’t able to relocate when conditions change. Coral reefs are one of the most diverse ecosystems on the planet, definitely in the oceans. Coral serves as both food and/or shelter for many other species, up to ¼ of all ocean species. And their location means they protect shorelines too. That is a lot of responsibility. Now let’s look at those stressors. Remember middle school chemistry? Yeah, me neither. Here’s a little refresher: water reacts with carbon dioxide to make carbonic acid (H2O + CO2 = H2CO3). Rising atmospheric carbon dioxide (yes, we’re talking climate change here) both increases surface water temperature and makes water more acidic. That’s two stressors, y’all. And more than 30 percent of human emitted CO2 gets taken up by the oceans. A paper published by Anthony et al. (2008) in PNAS did a nice experiment looking at what happens to different coral species when the ocean acidifies and/or warms. They collected three of the most important “framework builders” in Heron Reef in the Indo-Pacific and transferred them to lab aquaria: Porolithon onkodes (common crustose coralline algae [CCA] species), Acropora intermedia (a fast growing, branching species), and Porites lobata (a massive species). Next, they used a custom-built CO2 dosing (bubbling) and temperature control system to test different acidification and temperature regimes that simulate doubling and 3- to 4-fold CO2 level increases as projected by the Intergovernmental Panel on Climate Change (IPCC). Then, they waited, they watched, and they took pictures for 8 weeks. From these digital images, they measured the amount of color and reduction in luminance of the corals. They also measured net rates of photosynthesis, respiration and calcification. They found that increased CO2 (i.e., acidification) led to 40-50 percent bleaching in Porolithon and Acropora. For both of these species, the effect of increased CO2 on bleaching was stronger than the effect of temperature. Porites was less sensitive to increased CO2 alone, but was most sensitive in both stressors. High temperature amplified the bleaching by 10-20 percent in Porolithon and Acropora and 50 percent in Porites. In Porolithon, increased CO2 lead to a severe decline in productivity and calcification that was exacerbated by warming. Acropora’s productivity actually maximized with intermediate increases in CO2, but dropped at higher levels. Porites's productivity dropped with high CO2 but not like that of the Acropora. These species had similar calcification responses to each other, each much less than Porolithon. Overall, the authors proposed that CO2 induces bleaching through its impact on photoprotective mechanisms. Porolithon was the most sensitive to acidification, which is concerning because it is a primary reef-builder and serves as a settlement cue for invertebrate larvae (including other corals). A very recent study by Perry and Morgan (2017) in Scientific Reports zoomed out to look at corals at a large scale. They looked at magnitude of changes that followed the El Niño/Southern Oscillation (ENSO)-induced Sea Surface Temperature (SST) warming anomaly that affected the central Indian Ocean region in mid-2016, sort of a natural warming experiment. The ENOS-induced SST warming was above the NOAA “bleaching threshold,” defined as the point where SST is 1°C warmer than the highest monthly mean temperature. To do this they went to reefs in the southern Maldivian atoll of Gaafu Dhaalu, ran transects (basically, a line along which you measure stuff), and collected data on coral mortality, substrate composition, reef rugosity (a measure of complexity), and gross carbonate production and erosion. Then they determined carbonate budgets for the 3-dimensional surface of the reefs (there are equations…I won’t go into it…you’re welcome). They found extensive, overall coral mortality - over 70 percent. This was mostly driven by branching and tabular Acropora species (remember them from the last study? ), which declined by an average of 91 percent! All of this coral death resulted in a decline in the net carbonate budgets. This decline reflected both reduced coral carbonate production and increased erosion by parrotfish as they graze on the algal film that grows on coral rock. Pre-coral bleaching, carbonate production was dominated by branching, corymbose and tabular species of Acropora; post-bleaching production by non-Acropora increased, with massive and sub-massive taxa (e.g., Porites species) more than doubling. Together, carbonate budgets were reduced by an average of 157 percent! All of this equates to a rapid loss in coral cover, growth potential, and structural complexity. The overall impact of the carbonate budget was profound and has major ecological implications. 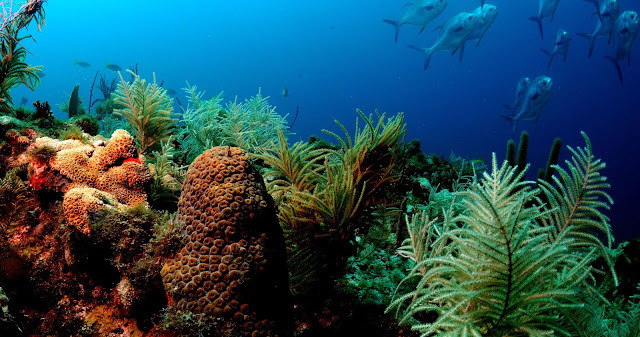 These habitats have gone from a state of strong growth potential to one of net framework erosion and breakdown; basically, the reefs are eroding faster than they are growing. And it may take 10-15 years for a full recovery, depending on the frequency of similar anomalies. So what’s the take-away from all of this? Corals are sensitive to their environment, but not all species of corals respond equally. Climate change is a huge factor in health and recovery of coral reefs, and steps need to be taken soon if we want to keep these little guys and the phenomenal habitats that they create.